On Friday, President Donald Trump revealed he will meet with North Korean leader Kim Jong Un at the end of February in Hanoi, Vietnam to discuss denuclearization. Trump had previously announced his second summit with Kim during last week’s State of the Union Address. He and Kim first met in Singapore last June and showered praise on each other after months of exchanging insults. 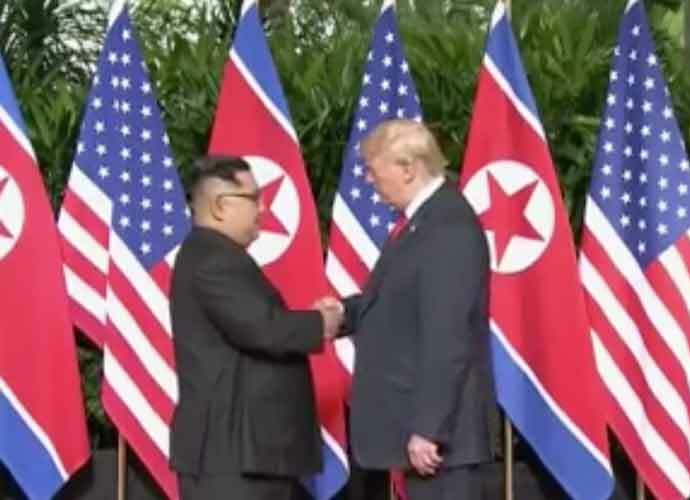 The former drew severe criticism for many things around the time of that meeting, including for lauding Kim’s authoritarian rule over his regime in an interview with Fox News. “He’s the head of a country, and I mean he’s the strong head,” Trump told Fox & Friends co-host Steve Doocey of dictator Kim at the time. “Don’t let anyone think any different. He speaks and his people sit up at attention. I want my people to do the same,” he added, gesturing toward the White House. Trump later claimed that comment was simply “a joke,” although he also said several months later that he and Kim “fell in love.” He was also sharply criticized, even by some conservative news outlets, for seemingly conceding more than he gained during his summit with Kim in Singapore. North Korea is believed to still be harboring nuclear production facilities, something that gives little hope that the nation will move closer to denuclearization anytime in the near future. In December, North Korea’s official Central News Agency demanded in a statement that the U.S. withdraw troops or reduce its military presence in South Korea. “North Korea will seek to retain its W.M.D. capability and is unlikely to completely give up its nuclear weapons and production capability,” Coats added. CIA Director Gina Haspel also said that Pyongyang is dedicated to building a nuclear missile that could “pose a direct threat” to the U.S.